Riel in the jury box at trial, 1885. Source: Library and Archives Canada, C-001877. Following the military conflict between the Canadian militia and the Métis during the 1885 North-West uprising, the Canadian government charged and convicted Louis Riel with the crime of high treason. 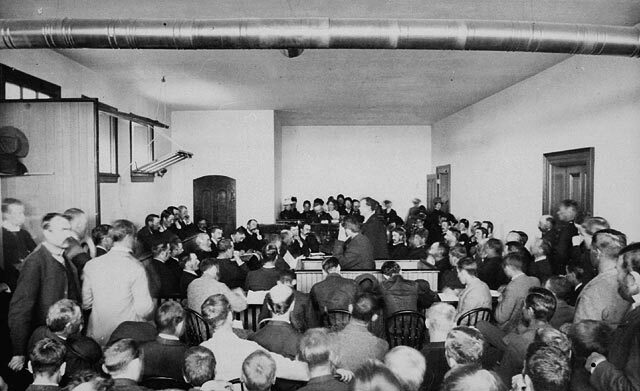 In this unconventional, highly publicized trial, Riel was given the opportunity to address the jury in his own words in regard to the grave charge that ultimately led to his execution. Riel’s court-appointed attorneys compelled him to accept their defence strategy of claiming that Riel was innocent on the grounds that he was insane. Riel did not accept this argument. In his final plea to the jury, he attempted to explain his thinking and reject the argument that he was insane. He discussed his religious convictions, his thoughts on governance and constitutional law, and the rights of Métis people and the rest of the people of the northwest. In this module, you will read Riel’s own words, as the court recorded them. You will consider his thinking in this final moment before he was convicted and sentenced to death. Louis Riel. “The Prisoner’s Address” in The Queen vs. Louis Riel accused and convicted of the Crime of High Treason: Report. Ottawa: 1886.